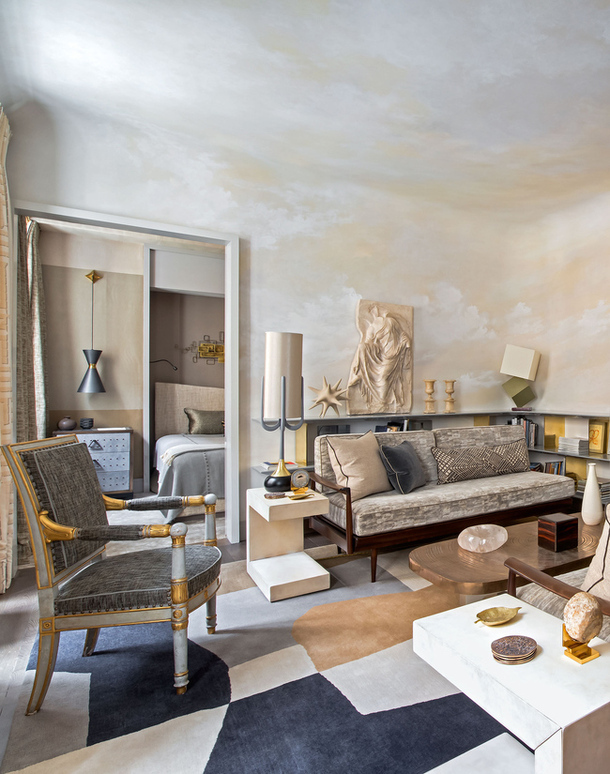 Interiors: Jean-Louis Deniot’s Paris Retreat Pt. 2 — Sukio Design Co. I love finding new images of favorite spaces. Last week, I stumbled upon additional photos of Jean-Louis Deniot’s Parisian apartment, which I blogged last August. Of all the pics, I was most smitten by the bathrooms. Yes, the bathrooms! Coupled with his fabulous silver and marble kitchen, I may dub Deniot as the "King of Small Spaces." In addition to King of Small Spaces, he may also take the prize for most innovative approach to surfaces. No wall is simply painted. These photos better capture wall treatments in the dining room, a striped custom paper, and the living room, a trompe-l'oeil application to walls and ceiling. Pretty. You also get a better sense of the apartment's layout. Lacking hallways, it’s simply a series of small, connected rooms. If you battle the same design challenge, Deniot’s approach proves that spaces can still relate while maintaining their own personality.